Deliver happiness by sending this Fanciful Hamper Basket with Warm Wishes to make others happy. This amazing Gift Hamper Basket comes with. 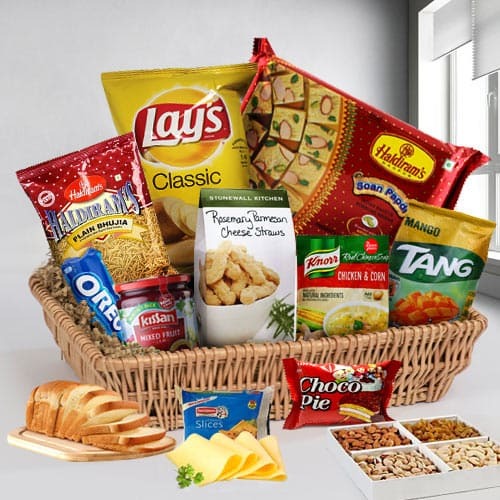 Haldiram Sohan Papdi (200 gms), Haldiram Bhujia, Assorted Dry Fruits, Cheese Straws Pack, Oreo Biscuits Pack, Lays Chips, Milk Bread, Jam, Cheese Slices,Tang Powder Pack, Knorr Soup, Chocopie are loaded with this Gift Basket.